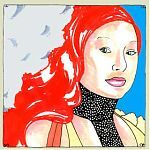 Tori Amos - Undented: What If Tori Recorded a Daytrotter Session & Nobody Knew? News: What If Tori Recorded a Daytrotter Session & Nobody Knew? Rather out of the blue, Daytrotter, a music website which brings artists in to their Rock Island, Illinois studios to record exclusive sessions that are shared for free, posted a session Tori did for them! As with most Daytrotter sessions, it’s four songs long, including “Lady in Blue,” “Ophelia,” “Pink and Glitter” and “A Silent Night With You.” All four tunes are available to stream and, if you register with the site, to download as well. Every session includes an artist’s rendition of the performer (this one is courtesy of Johnnie Cluney) and a written piece about the recording which is worth a read. Thanks to Eliot Lear for being the first to catch this and let us know!